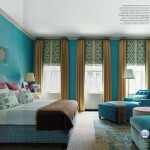 Cute bedroom in bright and bold hues with vivid turquoise walls painted in Benjamin Moore Meridian Blue. Great bedroom for a teenage girl with fun bold and bright colors yet it has a more grown up sophisticated decor. Turquoise blue with red and pink flower accents seen in the pictures of flowers above the red headboard, the red and pink floral bedding and the turquoise blue blinds with red trim. This second bedroom follows a similar color scheme with blue and turquoise wallpaper and turquoise trim painted in Benjamin Moore's Peacock blue, pink and white bedding and a white painted four post bed.